What does ABA look like? ABA is an umbrella term, used to refer to a way to maximize learning and minimize inappropriate behaviors. ABA may also go by: Discrete Trial Training (DTT), Natural Environment Training (NET), Pivotal Response Therapy (PRT), Verbal Behavior (VB), and more. Behavior analysis focuses on the principles that explain how learning takes place. Positive reinforcement is one such principle. When a behavior is followed by some sort of reward, the behavior is more likely to be repeated. Through decades of research, the field of behavior analysis has developed many techniques for increasing useful behaviors and reducing those that may cause harm or interfere with learning. 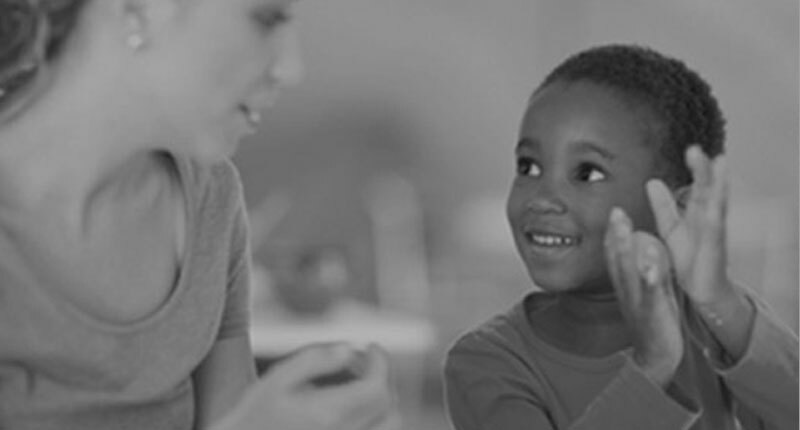 Applied behavior analysis (ABA) is the use of these techniques and principles to bring about meaningful and positive change in behavior. How long has ABA been around? ABA therapy has been around since the 1960’s. The belief and theory behind ABA has been around since the 1930’s. What theory/belief is ABA based on? ABA is based on the theories of Behaviorism, and Operant Conditioning. Operant conditioning basically states that an organism performs deliberately to produce a desirable outcome. Behaviorism basically states that pleasant experiences (such as rewards or praise) are positive reinforcers. They cause learners to make desired connections between stimuli and responses. Unpleasant experiences (such as punishment) are negative reinforcers. They cause learners to avoid undesirable responses to stimuli. A lack of any reinforcement can also shape behavior. If people receive no acknowledgement of their behavior, they will likely change that behavior until they receive some kind of reinforcement. Do you have a waitlist, and what is your waitlist process? Currently, Endeavor has a waitlist across all of our programs. However, we are in the process of expanding our space and our team to better serve more families in the Houston area. Wait times depend both on the program your child is applying for and the schedule that your family is seeking, but generally ranges from two to nine months. Our Intake Coordinator will call each family on our waitlist monthly to update their position and check that you want to remain on our waitlist, and you can also call at any time to do the same. We know that getting your child into services as quickly as possible can make a huge difference in their progress, and we assure you we are working hard to be able to help as many families as quickly as possible; however, we do take care to do so without sacrificing quality. Thus, it can take time to find good staff and train them to the level of expertise that we expect from our team, so we hope that you understand our waitlist is to ensure we only ever deliver an exceptional level of therapy to your child once they are in our care. What are my responsibilities as a parent as it relates to my child’s ABA therapy? While we are pretty amazing at what we can do for your child, none of it would be possible without the involvement of our children’s families and caregivers. We expect that parents be a large part of the treatment process and that we work together to be responsible for the success of our interventions. While we put forth 100% when your child is in our care, the rest of the time it is the caregiver’s responsibility to remain consistent with those same interventions in the home and community. As such, parents and others caring for the child are expected to complete training in ABA and on their child’s programs and interventions, as well as come in for hands-on training and consultation a minimum of once per month. Ask questions, read the reports we provide, do your own research, and help others that interact with your child understand that ABA can significantly impact your child’s life for the better. What populations can benefit from ABA? ABA is the most research supported therapy treatment for children with autism at this time. ABA therapy is intended to be administered early (children under five) and in an intensive manner to be most effective. However, ABA has also been shown to produce varying degrees of success in adolescents, adults, individuals with special needs other than autism, and typically developing children. The effectiveness of ABA-based intervention has been well documented. Children who receive early and intensive behavioral treatment have been shown to make substantial, sustained gains in IQ, language, academic performance, and adaptive behavior as well as some measures of social behavior, and their outcomes have been significantly better than those of children who did not receive such services. What Kind of Progress Can Be Expected with ABA? Competently delivered ABA intervention can help learners with autism make meaningful changes in many areas. However, changes do not typically occur quickly. Rather, most learners require intensive and ongoing instruction that builds on their step-by-step progress. Moreover, the rate of progress – like the goals of intervention – varies considerably from person to person depending on age, level of functioning, family goals and other factors. Some learners do acquire skills quickly. But typically, this rapid progress happens in just one or two particular skill areas such as reading, while much more instruction and practice is needed to master another skill area such as interacting with peers. What are the A-B-C’s of behavior? The A-B-C’s of behavior is a basic tool used in ABA to determine the function, or motivation (from the child’s perspective) of a behavior. A behavior intervention that is created based on the function of a behavior will be more successful than if the function is not known. How can ABA help me? Children and adolescents on the autistic disorders spectrum may exhibit a variety of dangerous, maladaptive, or inappropriate behaviors such as tantrums, elopement, self harming, aggression, poor social skills, inability to be toilet trained, etc. These individuals may also experience academic failure or difficulty, especially in areas of attention, impulsivity, attending, and generalizing. ABA at its core is a method to help children learn. Any behavior that a child can learn, ABA can help them unlearn, strengthen, or maintain. The future and quality of life for an individual with autism who can reduce inappropriate behaviors and “learn how to learn” is greatly improved. What can I expect when I apply for services at Endeavor? This can depend on whether or not we have a waitlist (see next question), but our therapeutic relationship starts as soon as you contact us for services. Our Intake Coordinator will set up an appointment to tour our facility and speak briefly with a member of our team regarding our services and your needs. Should you decide to proceed with services with Endeavor, your child will be scheduled for an hour-long interview at our clinic, where we determine the best placement within our program for your child. Once a program is determined, your child is placed on the list for that respective program, where they remain until one month out from their start date. When space becomes available in that program, our Intake Coordinator will contact you to set up your child’s initial assessment. This assessment can take anywhere from three to eight hours or more, and typically takes our team about two weeks to interpret the results and generate an individualized treatment plan. Upon the completion of the Treatment Plan, we will contact the parent to set up an initial consultation during which we review the assessment results and the resulting goals for your child. Once everyone is on board, we start your child in the program within approximately two weeks of their initial assessment. Please be advised that all ABA services do require pre-authorization from your insurance provider. This process can take 1-2 weeks or more to obtain, and can have a result on your child’s start date outside of the above indicated timeline. What age should I start my child in ABA? The sooner, the better! Research shows that early intensive intervention is extremely important in reducing the symptoms of autism and getting your child set for success later on in life. Plus, the sooner you obtain services for your child, the sooner you can learn the techniques and methods used by ABA practitioners to support your child’s progress outside of therapy, and the sooner you will be able to see results. How many hours of ABA should my child have? The number of hours your child should receive therapy varies depending on your child’s skill and behavior levels, and is something that is typically determined at the outset of treatment after an assessment is conducted. Treatment dosage falls into the categories of intensity, or the number of hours per week, and duration, or the length of time your child remains in treatment. The intensity of your child’s treatment can depend if the approach is comprehensive (goal is to bring your child to a functioning level typical for their chronological age) or focused (goal is to address a limited number of specific areas). Comprehensive treatment typically is defined as 25-40 hours per week of direct ABA, whereas focused treatment are related to the specific goal area and the child’s needs and may range anywhere from 4-10 hours per week. For younger children who are not yet in school, we typically recommend, as needed, a more comprehensive program as part of an early intensive intervention approach as supported by research. Comprehensive program hours are faded back as a child begins to demonstrate progress and independence in targeted skill areas and a child may move from a 40 hour per week program to a 10 hour a week program gradually over the period of a year or more. The BCBA managing your child’s case should let you know after completion of the initial assessment what the recommended number of hours per week for your child is, and should be able to provide a rationale for their recommendation. The duration of your child’s treatment also depends on their skill level and acquisition of independence at various stages of learning. It is common for some individuals to demonstrate a need for several years of treatment, or even from infancy through adulthood, whereas other children might only require a year or less of intervention. Caregiver involvement can also have a big impact on the duration of treatment required as more consistency across environments will result in faster acquisition of skills, and thus shorten the necessary duration of formal treatment by an ABA practitioner. What about biomedical and other treatments I see online or hear other parents talking about? Which ones should I try? With so many people being affected by autism spectrum disorder, the internet is full of treatments and suggestions for treatments that may or may not have worked for other families. While we wish there was an “easy button” we could press to improve your child’s symptoms effortlessly, ABA does take time and intensive effort, but its effectiveness as a treatment for autism is based on decades of research that validates it as a way to improve your family’s lives. Findings from several studies show that an eclectic model, where ABA is combined with non-evidence-based treatment, is less effective than ABA alone. Therefore, treatment plans that combine ABA with additional procedures that lack scientific evidence as established by peer-reviewed publications should be considered eclectic and do not constitute ABA treatment. Something that worked for another child could have been the result of an extraneous factor unrelated to the supposed treatment, as often these other treatments are not regulated or empirically-validated for confounds or outside influences. We encourage all families to do their due-diligence when considering the use of other treatment methods than may contradict ABA therapy and/or simply be a waste of time and money on the part of the family, leading to frustration, lack of improvement, and potentially regression in any progress previously made.